“This game has elements of RPG and adventure games, but it’s something quite different than most of them. This game has its own rules and special behaviors, so common sense for other games of this type may not always apply to it. Please approach it with an open mind and enjoy. That’s right, the major mechanic in Rance 5D is luck. Let’s go over the general aspects of the game and discuss some of the ways you can affect your odds. Movement through dungeons is done on this roulette, with the color of the orb you land on indicating what’s in store for the party next in the dungeon. There’s a time limit in each of 5D’s five chapters indicated by the bar on the top of the screen. Spinning the roulette normally will use up one unit of time. If you spin the roulette with “Slow” or “Cautious,” you’ll use more time but you can choose where you’d like to go after it stops. 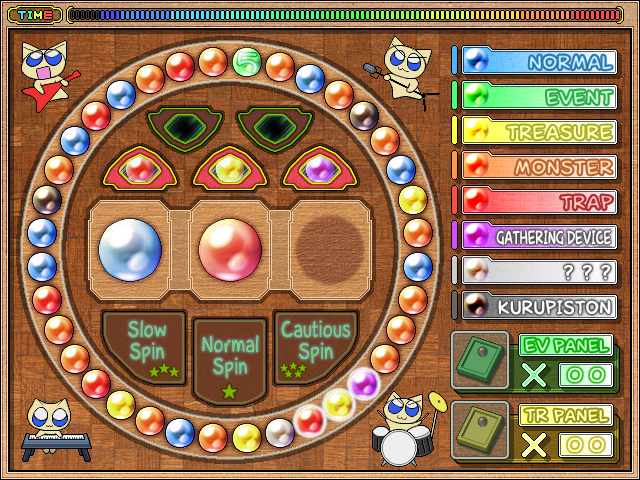 The large orbs in the center are a record of your previous spins (but only if you spin normally). If you get three in a row of the same color, something good will happen (probably). Green Orbs (Event): Important events. They start with 5 in each chapter, meaning there are five important events remaining. Aim for these to progress. If you use “Normal Spin,” the green orbs will increase in number, raising the probability of stopping on one. When the roulette stops on the 1 Event Orb, the chapter will end. Keep your remaining time in mind as you spin. Blue Orbs (Normal): Something happens in these places, but what happens will depend on who takes action, so try out all sorts of things. Yellow Orbs (Treasure): Places with treasure chests. Sometimes you can find some really good stuff here. Orange Orbs (Monsters): You’ll encounter monsters. The monsters that show up aren’t random. There’s a set order to them. Red Orbs (Traps): You’ll set off traps. Nothing good will ever happen here, so you’re better off avoiding them. Each chapter has its own set of traps, so if you have precautionary items for them, you’ll be all set. As for the other orbs, some of them vary depending on the chapter you’re in, so you’ll have to figure them out on your own! My personal recommendation would be to go for the Kurupiston orbs as often as possible. Most of the scenes in the game will take place on this adventure screen. Use it to advance to the next scene. Cannot be used if there is an X mark over it. Time ticks by on this icon with each action on the adventure screen. After five actions, one of the units in the time bar will be used up. Click to pick them up. Some items are sold at shops, too. Rance and his party members are displayed here. The frontmost character will be used when taking actions. In this example, it’s Rance, but you could make Sill the acting character by clicking her face CG. This card represents the important thing in the scene. Acting on these items (opening treasure chests, searching something) may require a success check. 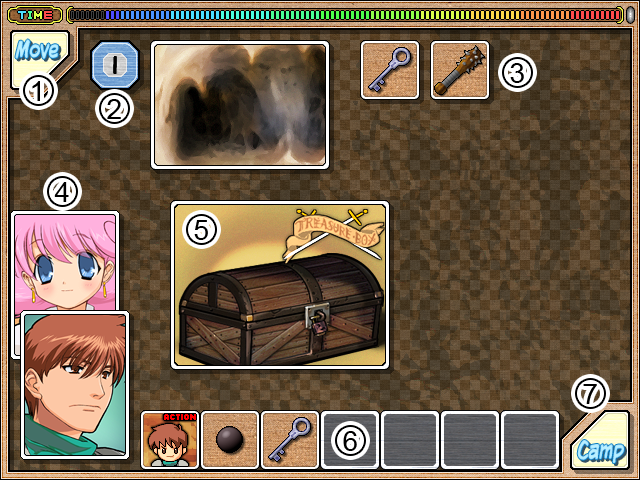 These are Rance’s party’s items. Not every item is displayed, just ones that may be useful in each scene. Use them by dragging and dropping them on your target. The first entry isn’t an item, but a special action the acting character can use. Use to enter Camp Mode. Rance’s party can complete various preparations on this screen. Resting costs one section of time, but character health will recover by 1/3. Check the status of your characters. Here, you can view characters’ stats including the amount of EXP they need to level, choose which of their skill sets to hone, and see what their weak point is (for instance, Rance takes double damage from attacks with the “light” attribute). Summon Level Goddess (in training!) Mikan to level up the party. Your three person battle party is shown here (though at first it’s just Rance and Sill). You can rearrange their battle formation by clicking the characters’ face CGs. Each character has six battle actions that can be rearranged by clicking them (but they cannot be switched with other characters’ battle actions). 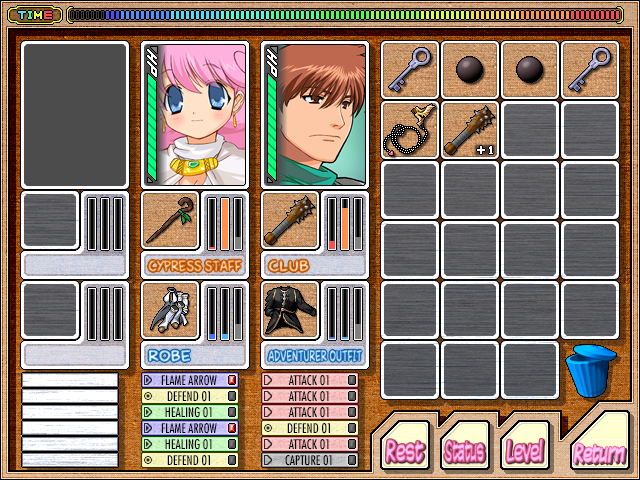 Use items by dragging and dropping them onto characters’ face CGs. If it’s an item that can be equipped by that character, it will switch places with what they have currently equipped. If the item is a character, that character will be added to the battle formation. Place items in the trash can to discard them. The line graphs next to weapons are, from the left: Attack (or Magic), Accuracy, and Durability. The line graphs next to armor are, from the left: Defense, Resistance, and Durability. Durability drops with each battle, and the equipment will break when it hits 0. When broken, it functions at 1/3rd effectiveness. You can summon the level god and level up as soon as you have enough experience. 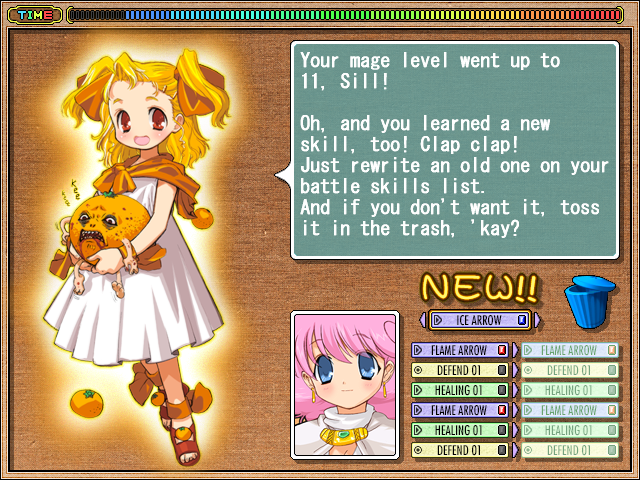 Everyone in the current battle party will level up, though only in the skill set that they currently have selected. Sometimes when characters level up they’ll gain new battle skills. These new skills can be switched with one of their current six by clicking one of them. If you’d rather not replace an existing skill, click the trash can. Battle skills can also be upgraded to stronger skills by combining identical skills. If Sill already knows Flame Arrow and obtains a new Flame Arrow skill, combining them will allow her to learn Fire Blast. Only humans can level up. Well, that’s probably enough for now! 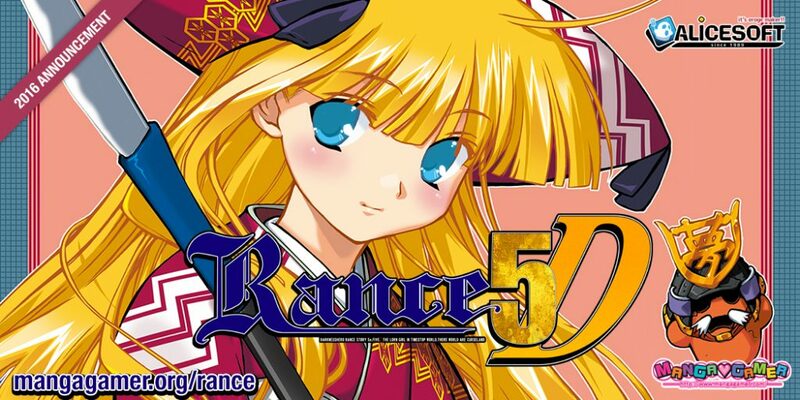 Next time we’ll go into Rance 5D’s (you guessed it) unique battle system and explain some more details about actions, items, and traps. But before we go, more trivia, on monsters this time! Gal Monsters: There are both guy monsters and gal monsters in this world. They may look like humans, but they are indeed monsters. They’re born through monster-monster breeding. Even beautiful frozens sometimes copulate with squidmen… Tohohoho. Capture Ropes: A specialized tool for hunting gal monsters. They can only be used when the monster is weakened, but they will capture her without further harm. Hunters make a living by capturing these monsters and selling them to enthusiasts. Lucky Can Can: The luckiest gal monster in the world. In fact, they’re too lucky, so if you defeat one, you’ll get oodles of experience. They live proactively, always trying to find the positives in any situation. It’s important to have a fortunate outlook if you want to live fortunately, isn’t it? Hannies: There are male and female hannies, as well as the Hanny King, ruler of the hannies (he does not appear in this game). The Hanny Flash attacks they release deal absolute damage to their targets. Also, magic does not affect them, so be careful when fighting them. « Himawari – The Sunflower – now on sale! Oh good, it’s still gal monsters. I’m dissappointed. I was expecting them to be called She Monsters. Nice, seems like they didn’t miss the reference to the Can Can game. Save some money for the release of Sengoku. That’s arguably more important for the release of Quest. I’m personally hoping they can minimize the release time between that and Quest which is why I’m still buying multiple copies of 5D/VI. Anyways, don’t worry about it. I bought 3 copies already. What are you going to do with 3 copies? Isnt thats an overkill? I have 2 cousins that will pirate the game so I’m paying for them. It’s not that I feel a moral obligation to pay for everything they pirate; it’s just that I like Rance too to not pay for them.